Alex & Me is one such book that I had been eagerly searching for, however as unfortunate as it may sound, it hasn't been available in Pakistan. So, knowing my craze for parrots, a friend of ours got it from England ... thank you Fawzia, I owe you for this! 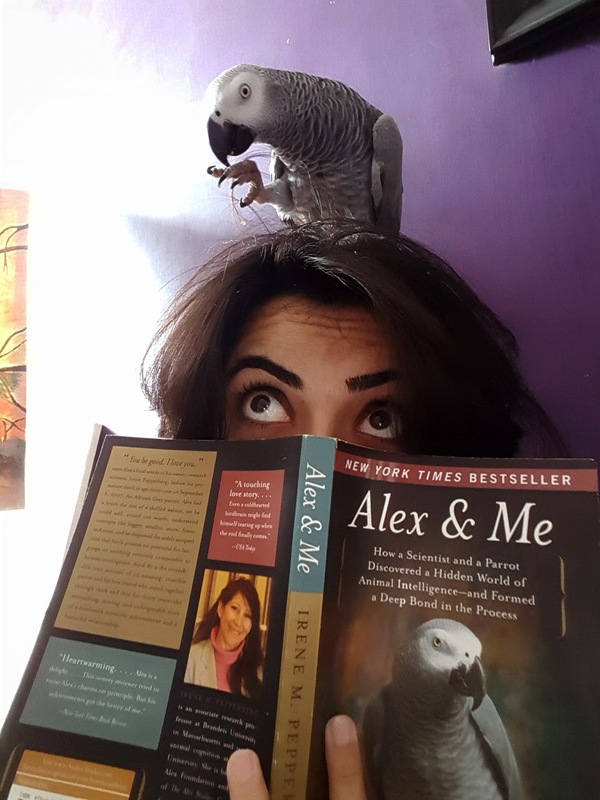 I simply adore the personality of Alex, the Grey Parrot that is the center of attention of this book. Having one myself, as you can see above, I can so relate to the tantrums and mischievous demeanour of this species. And as I got to acquaint myself with both characters, Alex and Dr. Irene Pepperberg, the bird owner (although our type isn't exactly classified as bird owners but rather slaves) I fell in love with both. This lady's perseverance deserves all the respect in the world; despite being let down several times she continued working for what she believed in. Proving the cognitive ability of a bird in a world of ignorant humans was indeed a taxing task, however both came a long way. Imagine sending a research proposal for a grant to carry out your study and being asked what you are smoking (Dr. Pepperberg's first attempt at acquiring a grant) is something one might not even directly ask a person who is perhaps even smoking weed ... oh yes, in that case the person would need help but in an intellectual case as this, the researcher is dealt with scorn. A drug addict is sent to a rehab and what do you do with an ambitious scientist? You ask her about her choice of drug ... how very cool. :P Never mind, human race can be funny sometimes, not knowing the real meaning of 'bird brain' as Alex later proved that this term could actually be used as a compliment. As you go along Alex and Dr. Pepperberg's journey through the pages, it hits you hard given the sheer intelligence of a small bird which was not sought out before and the stark reality that there will never be another Alex. It's as if the author is directly talking to you. Alex was so intelligent that he even started coining his own terms. For example, when he was given an apple he called it 'banerry' perhaps thinking that it tasted somewhat like banana and looked like a large cherry. All attempts at emphasising upon the word 'apple' failed as he was persistent on calling it banerry quite vehemently and in the same cadence which apple was mentioned in. The author writes, 'No matter how hard we worked to get him to say apple, he stuck with his label. As far as Alex was concerned, "banerry" it was and "banerry" it was going to stay.' This way of picking parts of two words and adding them together into one word is called 'lexical elision'. Imagine a parrot not inclined towards rote learning but conversing and rather arguing for what he thought was correct. At one occasion, Alex is described as being naughty. When shown a number of objects and asked how many of a specific colour they were, he deliberately started giving wrong answers after which Dr. Pepperberg decided to give him and break, took him to his room and closed the door. Immediately, Alex started calling out the correct answer, "Two ... two ... two ... I'm sorry ... come here!' he exclaimed. I know for a fact that these birds love to have their heads scratched and do not shy away from demanding some pampering, in Alex's case, he would say, 'You tickle' and as far as mine is concerned, she would grab my finger and drag it to her head, the rest is my duty to serve my mistress. It is mentioned that someone sent Alex a toy bird, he went toward it, bent his head down and demanded, 'You tickle', ofcourse, the toy was unresponsive to which he said 'You turkey' and walked away. Apparently, some students sometimes said this to Alex when he involved himself in dumb acts. Coco's demands are endless too. Sometimes, she would act lazy and not climb down towards the water bowl to drink water herself but would rather say, 'Coco wants water' and I have to oblige, these calls are at times fake and a means to lure my hand in for some scratches. And she enslaves other bird species too, on her whim. The ending of the book will make any pet lover emotional as it did to me, that's how the narration is ... so palpable! Even though it started off mentioning Alex's death, Dr. Pepperberg made the journey of her relationship with him so realistic that it almost felt like the brainy bird died yet again or that until then he was still alive. "You be good. I love you," Alex said to Dr. Irene Pepperberg. "I love you, too," she replied. "Yes," she said, "I'll be in tomorrow." This would squeeze anyone's heart! He died at the age of 31 in 2007 ... 10 years ago. Alex's conceptual knowledge was equivalent to that of a 5 year old human's while his communication skills can be likened with a 2 year old's. For the lovely person this lady is, she even replied to my email a few days ago for what was perhaps the last or the remaining few condolence messages. May she find peace in the thought that she made the most of the time she spent with Alex. What I learned through their relationship and perseverance is that if you truly believe in something you can make that happen, despite obstacles and hardships. Forget what people are saying now because tomorrow they will regret for not recognising what you were worth - their loss not yours. You don't really have to stand with the rest of the world ... stand out, make it happen and then enjoy the outcome. Relationships will be sacrificed along the way, people will leave you but that's life and in the end you would have achieved something and found true friends who were meant to be your pillars of support. Don't run after those who were not meant to stay with you while you struggled ... make room for those who cherish and respect you. And I hope that I am able to train my bird like the way Irene Pepperberg did. I'm not even close. Wow, simply loved the way you wrote this. You should write more often Hiba. You have this tendency to engage your reader, very very strong plus point. Impressive! Thanks, Muntazir! We are all in love with Alex aren't we? Love the way you write. Plus loves the gifs. Great blog, Hiba. Thanks, Emad! These gifs were too easy to make thanks to user friendly websites.